Monitor, analyze, and optimize Oracle Database 10g using the tested methods and insider advice contained in this definitive volume. 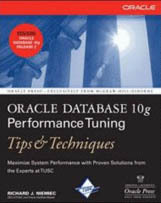 Written by Oracle Certified Master Richard Niemiec, Oracle Database 10g Performance Tuning Tips & Techniques is packed with detailed case studies, best practices, and code samples illustrating Oracle's new tuning features. Find out how to select optimal indexing options, effectively manage drives and disk arrays, troubleshoot queries, and reliably predict future performance. You'll also get detailed coverage of PL/SQL performance enhancements, initialization file tweaks, and the latest database surveying and reporting utilities.